Could your office benefit from a brainstorming session? Innovation is key in today’s rapidly changing business climate. Whether you’re thinking about new products and services or new internal processes, coming up with ideas to move the business forward can be a challenge. Brainstorming tools can help. 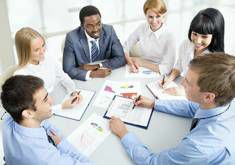 Brainstorming is generally described as a problem-solving technique in which groups work to produce ideas or ways of solving a problem by holding a spontaneous group discussion. It encourages members to let their creative juices flow, without filtering their responses. The hoped-for result is a list of options not already on the table. A few ground rules are important to successful brainstorming. First, you should have a good facilitator or moderator to manage the process. You want input from everyone, not just the few in your group who tend to be outspoken. The moderator will manage the team so that everyone can participate. Second, brainstorming generally means no filters. Participants are not allowed to criticize or minimize ideas as they are brought forth – that will happen later when the group decides which ideas to pursue. Again, a good moderator will keep this rule in play, reminding participants to hold their evaluations to a later time. Third, it’s a good idea to include a wide range of people so that you get a wide range of ideas. Sometimes the best ideas come from the least expected places. Finally, an atmosphere of trust and acceptance is important. If you truly want people to participate, they need to know their contributions are appreciated, no matter what they are. Otherwise, some of the best ideas may be withheld out of fear. Spontaneity is a great concept, but it sometimes needs a little fuel. That’s where brainstorming tools and techniques come into play. If your team is trying to get the creative juices flowing, try these ideas. a. Start with a large piece of plain paper (cover the wall, if you’d like). b. Give each team member a few colored markers. c. Draw a circle in the middle with the main topic you want to brainstorm. d. Add “branches” off the middle concept as team members bring up ideas that add to the concept. e. Add “twigs” to the “branches” as the ideas develop. f. Once the team feels it has exhausted the present ideas, the options (branches) can be discussed more fully to choose those that have the most promise. The others may be saved for later, or discarded. Mind mapping is particularly helpful for visual people. Seeing the ideas develop on paper helps continue the journey in their minds, bringing out even more ideas. a. White – List the facts and figures associated with our topic. What do you know? b. Yellow – List the positive points about the topic being discussed. What’s good? c. Black – List the concerns or negatives about the topic. What’s problematic? d. Red – List emotional responses to the topic. How does everyone feel about it? e. Green – List possible actions or solutions to the topic. What might you DO? f. Blue – This color represents the person moderating the discussion. He or she keeps everyone on the right “hat” or color until that part of the discussion has concluded. The result is a list of ideas that can then be ranked, fleshed out, assigned and tracked. The process keeps the discussion from getting derailed by the naysayers, as they get to have their say (an important part of the process to be sure) during the Black Hat section. The process also helps keep hidden emotions from interfering with the process because everyone has a chance to share their feelings during the Red Hat section. The Six Thinking Hats book gives more detail and examples. It is a great resource to have in your library. If your group has never participated in brainstorming before, they may need some time to get used to the idea. Start small with a topic that isn’t a live-or-die situation, and let them get some confidence in the process. Then, tap into the new resource for more critical issues. You’ll be amazed at the ideas your team can generate. – Denise Altman, CPA, M.B.A.